Bengali Garam masala is an aromatic blend of spices, which commonly used in Bengali cuisine. This spice blend also uses in different Indian cuisine. In India, the ingredients of Garam masala differ according to different regions. There are two forms of garam masalas in Indian cuisine. Firstly the whole garam masala, which mostly used in tempering. Secondly, ground garam masala which uses in seasoning. 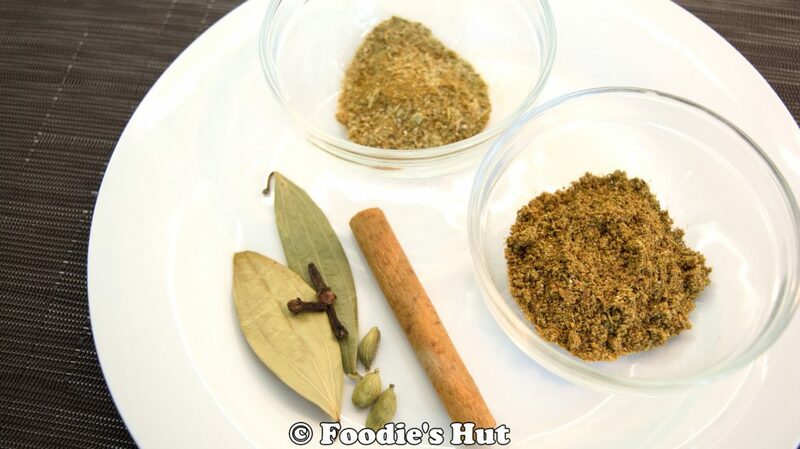 There are three types of Garam masala used in Bengali cooking. The first type of Bengali Garam Masala is whole spices and uses in tempering. The second type is regular garam masala powder which uses in everyday dishes. The third type is Shahi garam masala which mostly added in party dishes to make them more aromatic. Note: Personally most of the time, I don’t add cloves while tempering my regular curries, because I feel the flavor of clove is very strong for regular curries/dishes. Heat a nonstick frying pan over a medium flame and add all whole spices into the pan in a single layer. Stir with a ladle for a few seconds to warm them up, this process will help to get the flavor going if you are using old stock of whole spices. If you are using freshly packed whole spices, you don’t need to follow the above given process. In a coffee grinder or blender add all ingredients together and grind them to get a fine powder. Pour into an airtight container.